If you were around for the Rustic Dining Room Reveal back in January, you know that it's been my desire to figure out how to brighten, lighten, and add some character to our home without having to bite the bullet and paint alllll that stinkin' wood trim. I've been blown away by the HUGE difference that paint colors and bringing white into a room can make, without having to commit to painting all the trim white. 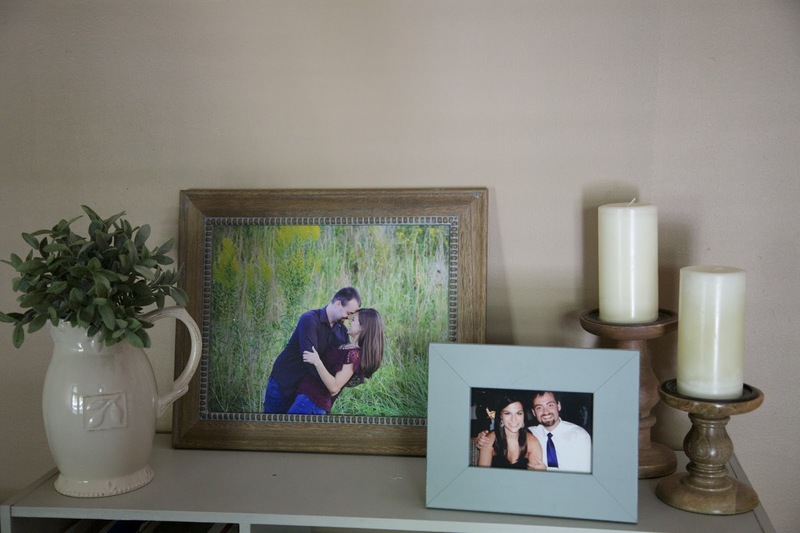 I was absolutely thrilled by the results of our dining room, but of course completing it made me feel that our front room just didn't fit and flow with my favorite new space. 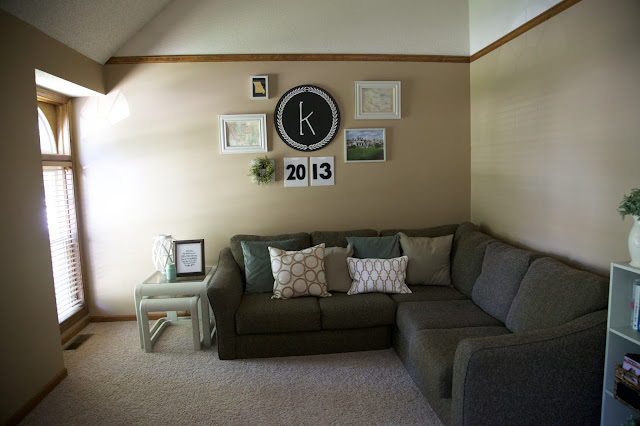 And thus, the dreaming for the farmhouse living room front room began. 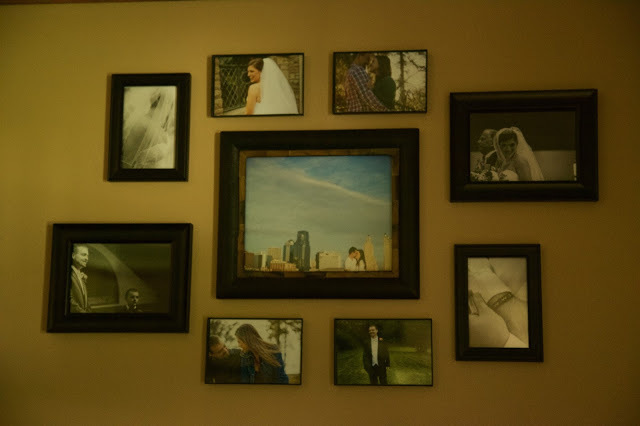 Our front living had a fun mini gallery wall that spoke of our love story and travels. 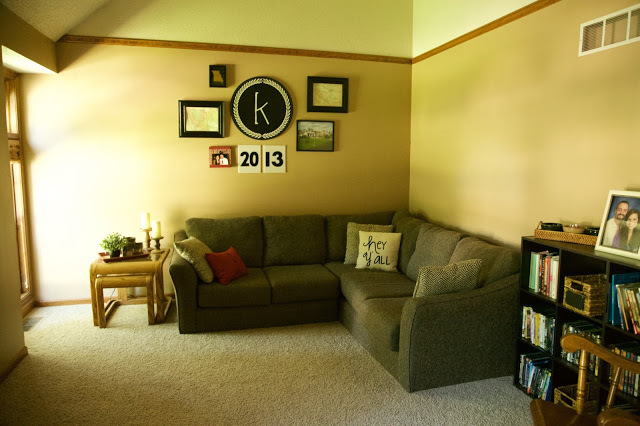 I had put literally no money into this room at all, using Aaron's old college couch, a thrift store coffee table, a hand-me-down shelf, and a rocking chair that we found outside on our neighbor's curb (you can't make this stuff up!). But it just felt so black and white heavy, and the dark red accents didn't do it any favors. I was ready for something new. After much debate on painting the entire room (high ceilings and all), I decided that I liked the pale tan color enough to keep it around. I decided instead to focus on bringing in the whites, pale grays, and pale greens that I had leftover from the dining room painting. Check out the difference in this mini gallery wall alone. Same photos, so much brighter. Literally zero cost and very little time. Next on the list was to bring the oak rocking chair to new life. 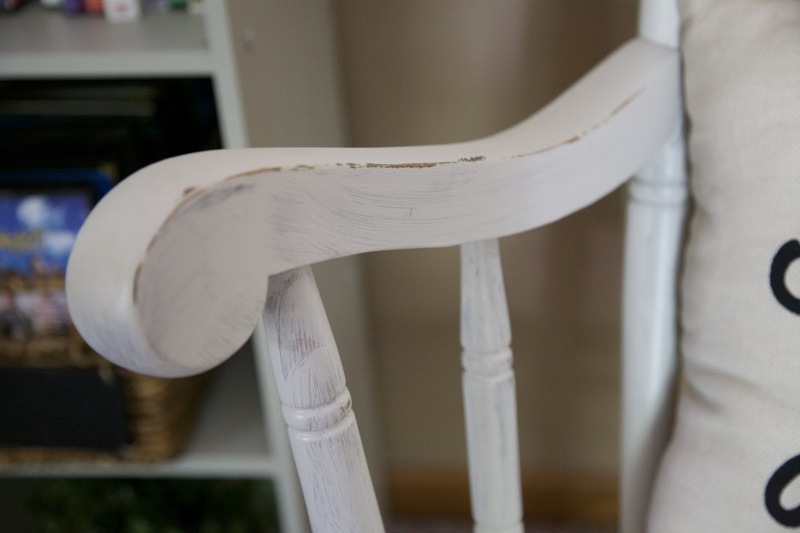 I took the white sample paint that I hadn't ended up using for the dining room and used it to cover the chair. After letting it dry, I grabbed a small piece of sandpaper and took some paint off the edges to give it a weathered, rustic look. 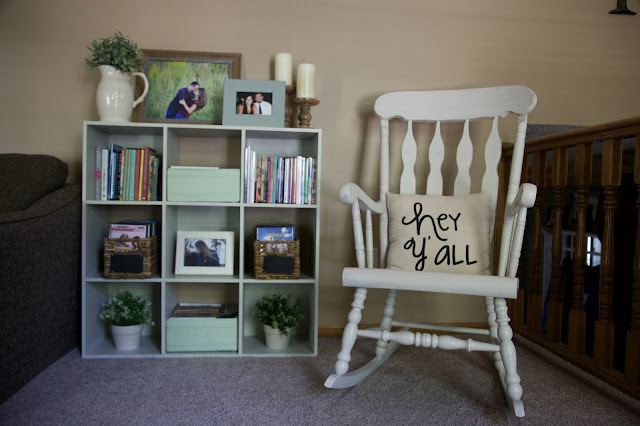 Of course, my favorite "Hey Y'all" pillow (Hobby Lobby) made the perfect finish to the chair- one of my favorite parts of the new room's vibes. I love how it pops in the space, instead of blending into the railing like it used to. My next project was to bring our free black cube shelf to new life. I used my favorite color ever, Cliveden Gray Morning, which is the pale green that I used on the top half of our rustic dining room walls. I love the flow it creates into the other room now, and the perfect pop of color it brings without being too dark and dreary. 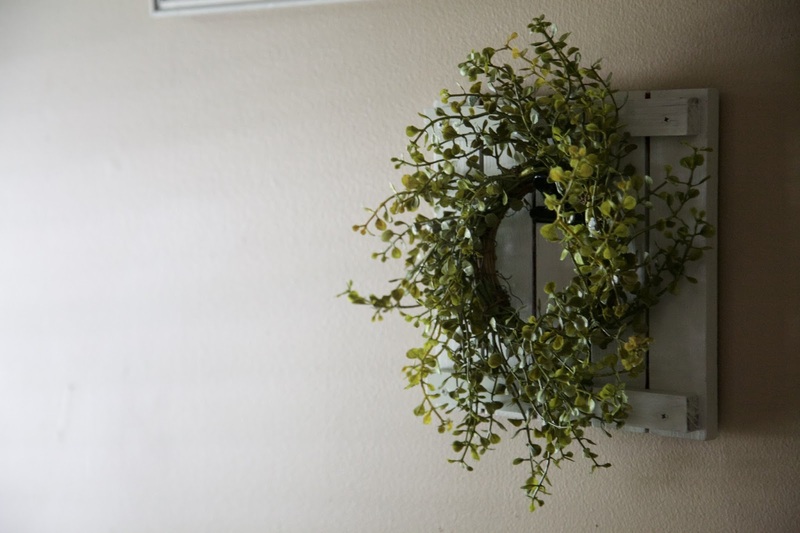 It brings air and light into the room, and is the perfect place for my favorite white, green, and wicker accents. To accessorize, I found several items at IKEA that I love: fake plants, pot holders, and pale green cubes that made our movie shelf look much more organized and a whole lot more pretty. 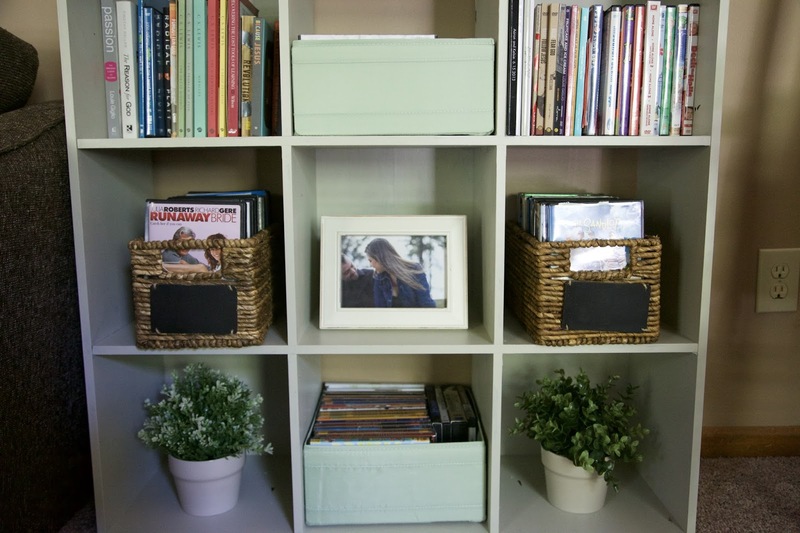 I had two matching wicker baskets from Kohl's that had just been sitting awkwardly, so I made one basket of chick flick movies and one basket of guys' night movies. I'll probably write something clever and cute on the front chalkboard slabs. For the top of the shelf, I brought in greens and pale whites to keep the theme going. I used the white vase (wedding gift) and another fake plant from IKEA, found an awesome 80% off frame at Michael's, and finally printed one of my favorite photos from the amazing Lacey Rene' Studios shoot we did last September. Throw in my rustic candleholders and a pale green frame I found on clearance at HomeGoods, and we were set. 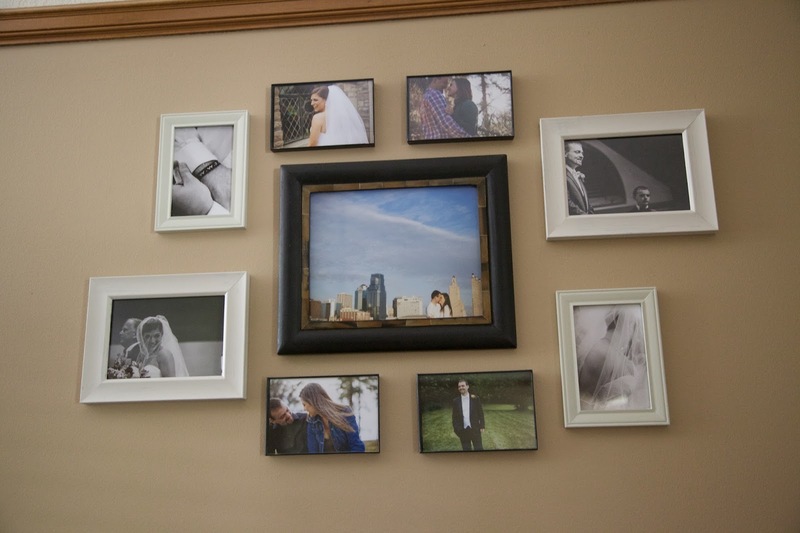 Another area of focus was the gallery wall. I set to work paining all of the frames in white and Cliveden Gray Morning. I also painted the red wood frame the pale green, and then found the perfect baby wreath from Magnolia Market. (This place is the bomb!) It sits just perfectly on the top of the clip the frame had for photos (which I didn't really want to add). The space is so much brighter and lighter. And then, of course, comes the ever so fun task of pillows. Before we had three gray and white striped pillows that had come with the couch with Aaron bought it. I had one small red accent pillow as well. I decided to find pillow covers to cover the pillows so I wasn't buying six new pillows, and then find a few new pillows I loved. Pillows and side table before. Pillows, side table, and gallery wall after. IKEA had the perfect pillow covers to give just the right pale pop of green, while also having a tan option to balance the neutrals and brighten the couch a bit. 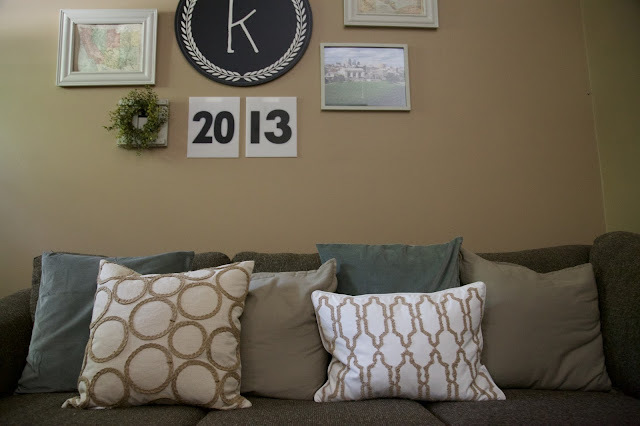 I found two patterned pillows that I just loved, one in tan and one in white, at HomeGoods, and I was sold. After playing around with arrangement, I found one I loved. 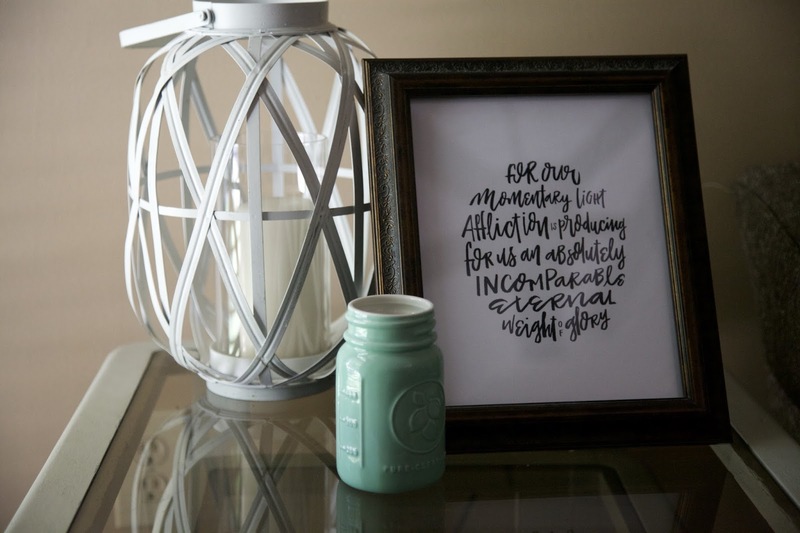 For the last few fun accents, I rearranged a few things I already had, painted the side tables pale green, and found a cute print on the She Reads Truth Shop with one of my very favorite reminders. 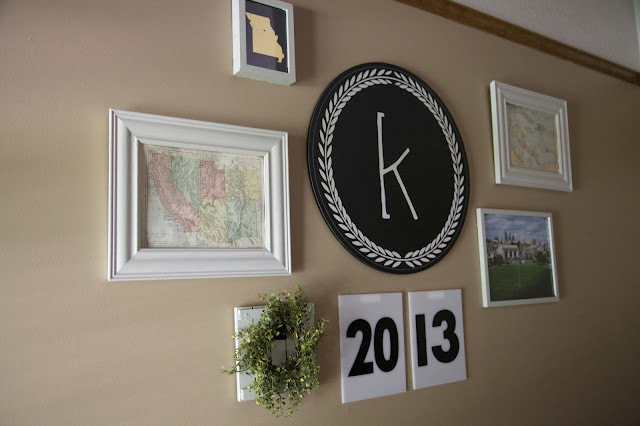 I also found this too cute sign at Hobby Lobby, and switched it out for the dark brown and black sign that once held its place. 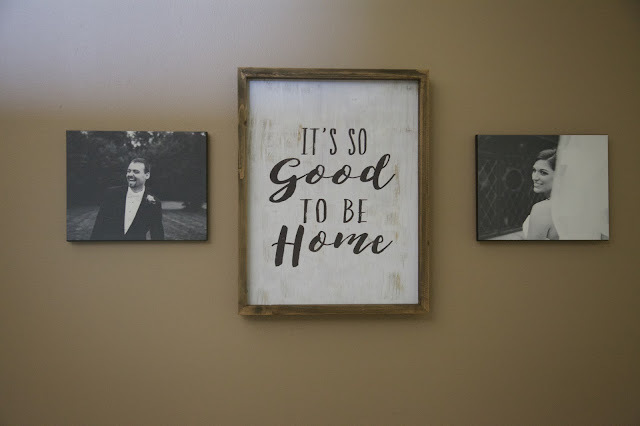 I'm slightly obsessed with the cute handwriting, and love how it ties in the white from our black and white wedding photo canvases. Now every time I come into our new Farmhouse Front Living Room, I smile and agree that "It's So Good to be Home". Ever have moments like that? I'm so grateful that I didn't have to paint the entire room to make it feel more like a farmhouse, rustic, flowing room that fit with the rest of our newly re-done upstairs. Especially because it gave me more time and money to dream and play a bit with pillows and fun new pops of decor. 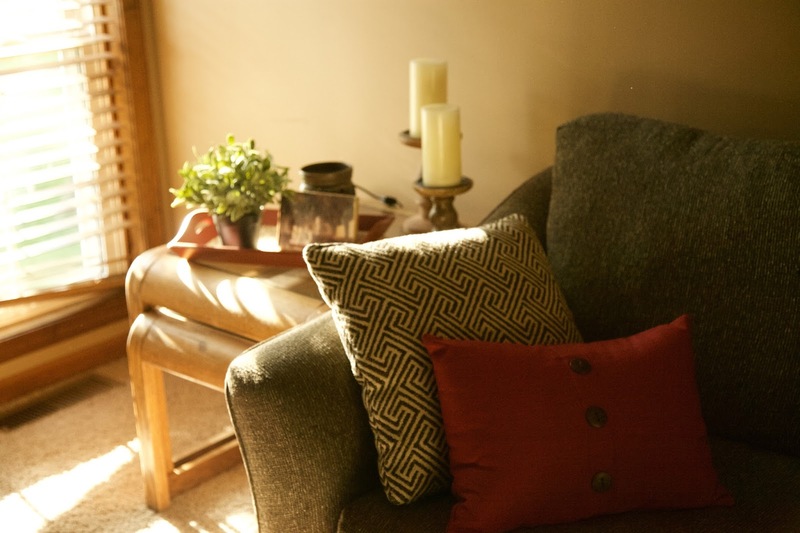 How are you bringing light and farmhouse charm into your home? What room do you have new dreams for? Your picture wall is great, and all the little touches like the ;allows and baskets to hold magazines looks great and keeps everything neat. Great work. Thanks Candace! I'm all about frugal, cute, and useful- an organized chaos ha. This looks so nice! We are moving soon so I am loving seeing everyones before/after pics for ideas! Thanks so much, Lauren! I hope you have an amazing time with your new place. I would recommend taking a while to dream and think before you commit- that always helps me when decorating new spaces. What a beautiful job! I am a bit obsessed with all things farmhouse :) I have a farmhouse pinterest board too! I love how all your ideas are simple enough that anyone can do it and not break the bank. Thanks for sharing! Thank you, Terryn! I too am obsessed with farmhouse! I'm all about that cute and easy, but not pricey. Thanks for reading! It looks so good! There are so many elements I want to recreate! The photo wall! The blue mason jar! Love love love! Gahh, thanks so much Rachel! You rock! Magnolia Market is AMAZING! I want ALLOFTHETHINGS! I like your new living room. I particularly like your pics for Ikea to go on the shelves. Yes! I want ALLLL the things too haha. Thank you, we love Lacey Rene' Studios and our photos from last fall! I'm loving the Farm House updates. I've been meaning to do the same. IKEA is my FAVE! Alexis, thanks so much. I am slightly obsessed with IKEA. It's the bomb! I love the wall frames redo. 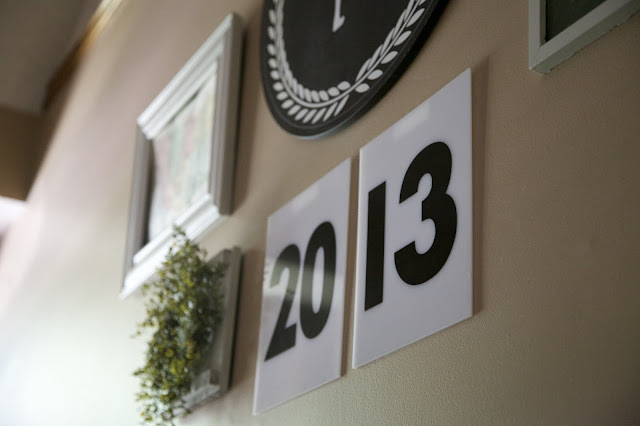 The 20 13 is awesome!! Thanks so much, Angela! I actually got those for like $1 each at our first Fridays weekend in the KC West Bottoms! Your living room looks so cute! I am getting serious Fixer Upper vibes and I LOVE it. Looks great! I love what you did with the rocking chair, and the pillow ties it all together. Nicely done. Thank you, Lesley! I love that little pillow ha! I love what you did! It is so much brighter and has such a good vibe to it! Thanks so much! I am always amazed at how much paint makes a difference. Looks great! It is awesome how much a little paint can change about a room! You have some super cute decor too. Thank you, Ashley! I agree- paint is the bomb! Love the new look! It feels so open and bright! Amanda, thanks so much! I agree- it makes a big difference and I love how it turned out! 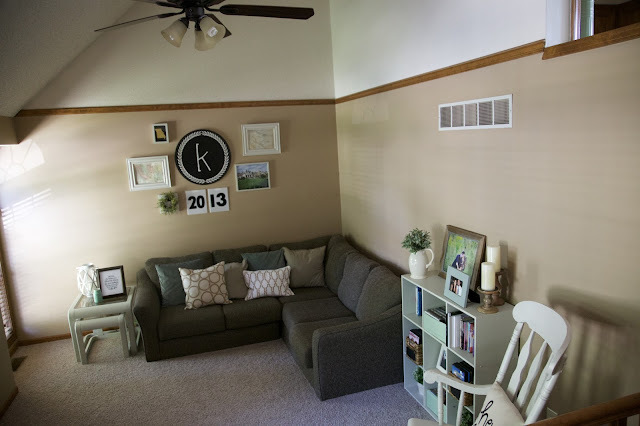 Wow,Kelsie, with only a little bit of paint here and there and some fun accents you really made this room look so different! It always amazes me, what a little bit of white paint can do! Love all the details you added in the cube shelf, so cute! And that rocking chair is fabulous with the pillow on it! Your sofa is really nice and those new pillow cases gave it a whole new look! Great job! Thank you so much, Katrin! You're way too sweet. White paint and little details for the win :) Hope you're doing well!! It all looks so different with just a little paint! I'm a little jealous of Ikea stuff... I've never been and the closest one is like 6 hours away. I can't believe how much brighter the room looks! I know, right?? I love it! You'll have to come to KC and hit up IKEA! The item generally amazes everyone, what exactly a modest amount of light color is able to do! Appreciate all the info people added in from the cube rack, and so lovely! And this rocking lounge chair is usually amazing while using the bed sheets on there! Love the entrance specially the comfortable cozy sofa in front of it, visitors too love to visit and get conform doesn't wasting any time, a perfect place which is best to place the sofa set.